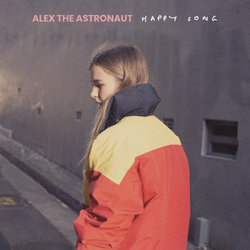 Ahead of her forthcoming Space Tour this November, Alex the Astronaut shares her new single 'Happy Song'. Performed for the first time to a packed tent at Splendour in the Grass, 'Happy Song' is a track that trades in equal parts melancholy and optimism and aims straight for the heart. It's been a productive 2018 for Alex, who is currently on tour in Europe for the second time this year. She sold out a co-headline national tour with Stella Donnelly, played UK's The Great Escape, Primavera in Spain, Spin Off Festival, Splendour in the Grass, and Manchester's Neighbourhood Festival. In July she shared 'Waste of Time', which was added to full rotation on triple j and garnered international support from BBC Radio 1 (Huw Stephens) and Radio X (John Kennedy). She stole the show at triple j's One Night Stand, where she performed a show-stopping cover of Bob Dylan's 'Blowing In The Wind' (with Sam Cromack). Alex says: "I wrote this song at the start of the year about the awkward middle part of a breakup when you don't really know what you're doing. I recorded it with Sam (Cromack) and Dan (Hanson) from Ball Park Music and it took us about nine months to get it right so it's pretty much a song baby.